This may be true in some cases, but I doubt it is true in most cases. I was pointed to a classic case of this problem just today. 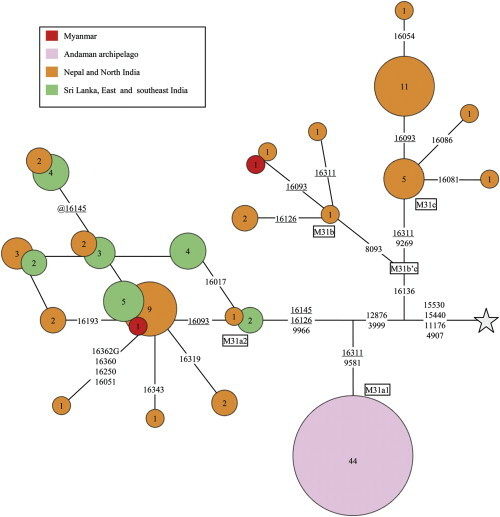 A reader alerted me to a short paper from this spring which attempts to ascertain the point of origin of the dominant mtDNA haplogroup among the Onge tribe of the Andaman Islanders, M31a1. This is an interesting issue because some researchers proposed, plausibly in the past, that these indigenous people in the Andaman Islands represent the descendants of the first wave “Out of Africa,” who took the rapid “beachcomber” path. Understanding the key to their genetics may then unlock the key to the “Out of Africa” event. Or so we thought. It looks like the human evolutionary past was a lot more complicated than we’d presumed. In summary, by extensively studying a large number of Myanmar samples, our results failed to find any root lineage of haplogroup M31 in Myanmar, therefore suggesting that aboriginal Andamanese were unlikely originated from Myanmar, the closest region to the Andaman archipelago in geographic. Nevertheless, we still cannot completely rule out the possibility that the matrilineal landscape in Myanmar had been largely shaped by the Neolithic immigrants from the neighboring regions, addressing this issue needs extensive studying on the Myanmar populations. Significantly, our further analyses strongly suggested that Andamanese-specific M31a1 finds its origin in northeast India. Therefore, it seems that the ancient people bearing M31a root type likely had peopled the Andaman archipelago via the land-bridge connecting the Andaman archipelago and southeast Asia continent around the LGM. Bingo! At a minimum it seems likely that the Onge have been resident in the Andaman Islands for ~10 thousand years. Therefore we should be cautious I think about making too many inferences as to whether their ancestors were resident only in Mynamar, or spanned the South China Sea to the Indus, and so forth. But, I think we can grant that they arrived via Mynamar, and were once resident in Myanmar. The disjunction between mtDNA lineages in their rather large sample strongly implies that Myanmar has seen major demographic reshaping since the ancestors of the Andaman Islanders parted ways with their mainland kin. This stands to reason. It is almost certainly likely that Myanmar was dominated by populations speaking Austro-Asiatic languages at some point in the past. These were replaced by the ancestors of the Burmans, Karen, etc. And to some extent even these have been displaced by newcomers, such as the Shan. But the Austro-Asiatic people themselves probably came from further east. If, and it’s a big if, the kin of the Andaman Islanders were the population which immediatedly predated the Austro-Asiatic groups, then there have been two linguistic shifts, likely accompanied by major genetic turnover. In fact I suspect there were probably more transitions in the past. I doubt hunter-gatherer populations were quite as static as we sometimes seem to posit, at least in the past 40 thousand years. 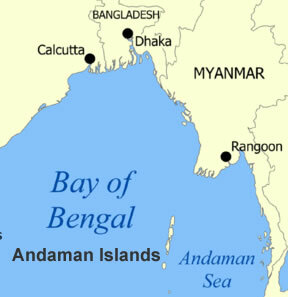 Previous work has suggested the “recent settlement” of the Andaman archipelago about 24 ± 9 kilo-years ago (kya) (Barik et al., 2008). In view of the time estimation results based on the updated phylogeny tree of haplogroups M31, peopling the Andaman archipelago would have occurred after the differentiation of lineage M31a (19.82 ± 10.01 kya) and before the divergence of M31a1 (7.96 ± 3.91 kya) (Table 2). Intriguingly, a similar result was achieved by studying the whole nuclear genome, in which the Andaman aboriginals were suggested to be originated from the potential ancestral populations of South Asian sub-continent before the admixture of ASI-ANI on the mainland (Reich et al., 2009). Noticeably, the paleoclimate evidence and data of Global Ocean Associates prepared for the office of Naval Research have showed that the sea level of Southeast Asia was about 120 m lower than that of today before 17 kya, and most of the sea level of Andaman sea was above 100 m today, supporting the existence of the potential land-bridge connecting Andaman archipelago and southeast Asia continent before the Last Glacial Maximum (LGM) (22–18 kya) ([Voris, 2000] and [Clark et al., 2009]). Taking into account the interesting distribution patterns and time estimation results of different subclades within haplogroup M31, it is likely that the ancestors of aboriginal Andamanese had arrived at Andaman arhcipelago around the LGM through the land-bridge before it was submerged with the raising of the sea level after the peak of the LGM. 3 Comments to "Present Genetic Variation Is a Weak Guide to Past Genetic Variation"
Given the fact that the dates confirm each other, the land bridge date of 22-18kya seems pretty reliable and the mtDNA method used seem to be confirmed. This puts the settlement of the Andaman Islands at least 20,000 years after the settlement of Papua New Guinea and Australia. And, while they may not be “living fossils” from the “Out of Africa” era, there aren’t many populations that have pretty definitively been isolated that long. In addition to Papuans and Australian aborigines, you have the Jomon (ca. 30,000 years ago) of Japan although there seems to have been minor admixture in at least the related Norther Ainu with Siberian populations, and the segregation of sub-polar New World populations from Eurasian populations of similar time depth to the Andamanese (since they relied on the same land bridge effect). The only other populations I can think of that seem to have pretty definitively pre-LGM coherence are a substratum of Tibetans, the Bushmen, and the Pygmies. In other cases, that possibility of material post-LGM resuffling is immense or certain. derivation of M31 -> M31a -> M31a1 is meaningful phylogeographically in relating groups today. future aDNA work. I am not holding my breath! There is another issue here. If 90+% of all mtDNA lineages that have existed once are now extinct, WHY would we think that a sample of fewer than 1000 individuals would adequately sample all the variability that existed in the past? The same problem arose comparing the mtDNA of a small number of Neandertals with a database of a few thousand individuals from different modern human populations. I think this question of adequate sampling is much more complex than has been assumed in the past, Maybe 846 mtDNA samples from Myanmar is difficult to obtain & analyze, but is it adequate?